The air in much of China is so bad the government has repeatedly declared "war" on it. The enemy are tiny particulates which spew forth from countless cars, coal-fired power stations and steel plants to create a dense, putty-coloured smog. Beijing recently issued its first pollution 'red alert', closing schools, factories and construction sites, and ordering half of all private cars off the road. "You can definitely smell the pollution. Your eyes itch, you cough. It's like a very rich, dense soup when the pollution levels are very high: thousands of chemicals, gases that are irritants, carcinogens. "We have particles that have a diameter smaller than a virus. Human hair is very big compared to these. The larger ones will be deposited into the lung - that's the biggest worry. But recent scientific evidence shows that when the particles are small enough they go into the bloodstream, they can go directly into the brain. "It's very hard to get data to show whether the pollution is going to have a long-lasting effect, like a cancer, but there is a reason to believe that, because the pollution soup contains chemicals which can induce cancer. "It's very frustrating to see pollution get worse after the huge effort which went into cleaning up the air in Beijing for the Olympics. "I did several studies demonstrating that if you do a temporary intervention to bring the air pollution down, [and] measure cardiovascular and respiratory health indicators in young healthy people, all those indicators significantly improve. "Women whose pregnancy was during those eight weeks of improved air quality got babies with a significantly higher birth weight, and we have a large database to show that in general if your birth weight is higher, your later life is healthier. "In 2008 the air quality data was considered a state secret. The government was in a denial stage for years until 2013 when those huge episodes happened, and then they started to say 'This is real now'. Because of [prioritising] economic interest over public health interest, the way they implement the existing air quality regulations is very inefficient. "Although it's now getting much better - the urgency is there - it's still very challenging." Hongjun Zhan used to write China's air pollution laws and now works for a US law firm advising foreign companies operating in China. "Back in the late 1980s, people didn't really think about air issues at that time. The pressure [to get the legislation right] was not big at all. "From the late 1980s to, let's say, the year 2000, just about a dozen years, that air quality has been getting worse and worse. "In many situations, industry discharges pollutants without meeting standards. And very often they are not penalised by the enforcement officers. "The law drafters today are doing a much better job than I did. The environmental laws today are more aggressive: [more] detailed, accurate, and comprehensive than the law I wrote. "Enforcement is still not good enough. It is slightly better, but it's still far from where it should be." Li Yan is the voice of Greenpeace in China. "Actually what's happening in China right now is quite positive. [The red alert] is a sign of progress in government's understanding of how they should react and respond to these extreme conditions. "Not only is it responding to 20 million Beijingers' demand for clean air, it's also setting a precedent for many other Chinese cities to follow. "After the 'airpocalypse' in 2011/2012, the central government responded with a National Air Pollution Action Plan. At the core of that is a scheme to cut back coal use in the big metropolitan regions. 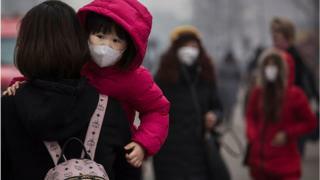 Image caption During the 'red alert' people were urged wear masks and "take protective measures"
"Beijing's extreme pollution and the 'red alert' are connected to China's addiction to coal burning, and it's very energy intensive way of industrial growth. Coal burning is the biggest single source of air pollution in China, and burning of coal, has for the first time in this century declined in 2014 compared to 2013. "That's a very significant thing. As a result air quality in the major cities like Beijing and regions in the Yangtze River Delta has seen improvements. "Greenpeace has been capturing the government-released hour-by-hour data of 190 cities, and only 15% of them have seen an increase of their readings, and all the rest of them are more or less improved. "We're seeing renewable energy picking up and taking larger share of total power use in China, and then it's actually already eating up the market space of coal. "New coal power plants are still being proposed and still being invested [in] by local government and state-owned enterprises as if it was still the good old days. However I doubt there will be enough demand to support them, and they will very likely become idle plants." Mun Ho is an economist at the Harvard University China project, specialising in Chinese environmental policies, and is a visiting scholar at Resources for the Future in Washington, DC. "The Chinese system is very decentralised: the provincial and local city authorities have a lot of power. And it is not a simple matter of the central government in Beijing pressing a button and all the laws are enforced. "All the city environmental protection bureaus are in charge of enforcing [pollution] laws, and you can imagine there is a wide range of enforcement standards across the country. "For the past 30 years, the main criteria of promotion other than maintaining security, is economic growth, the competition to bring jobs and growth. "We should align incentives so that the environmental officials have the incentive to enforce the rules throughout the system, not just the central government. "The unexpected economic slowdown and the prolonged global recession has been a new challenge. It is complicating efforts to convince people to put in costly pollution equipment and to think about energy-saving technologies. "China is officially growing at about 7%, but that hides quite a big range of experience. In some places - in the 'rust belts' - growth has really decelerated, perhaps even to 2%. "The priority obviously then is to prevent layoffs and factory shutdowns. They have to worry about social stability if there is high unemployment. "The issue really is spending a bigger part of the government's budget on pollution control equipment. Governments today are rich enough that this is no longer such a very big issue. We are not talking about building houses versus building pollution control equipment. This is no longer the stark choice facing China today."